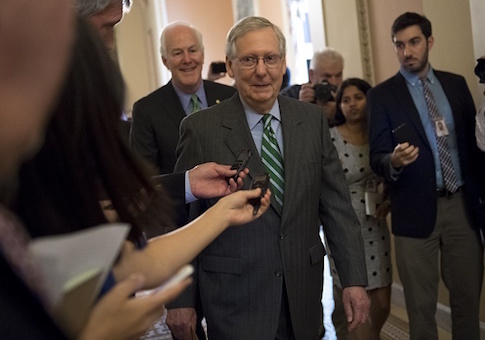 The Better Care Reconciliation Act of 2017, the Senate Republican replacement to the Affordable Care Act, is estimated to reduce the deficit by $321 billion from 2017 to 2026, according to the Congressional Budget Office's scoring of the legislation. In comparison to the Obamacare replacement, the American Health Care Act, passed by the House, this bill would save an additional $202 billion over this time period. During this span, the budget office also projects that spending will be reduced by $1 trillion and government revenues will be reduced by $701 billion. The legislation's greatest savings come from reducing spending on Medicaid and eliminating the Affordable Care Act's subsidies. Medicaid spending is estimated to decline by 26 percent by 2026. Instead of spending more on Medicaid, the legislation will spend more money on ways to reduce premiums and repealing Obamacare's penalties on employers and individuals. The budget office says that the new legislation would lower average premiums enough to attract healthy people to stabilize the market, which was one of the reasons many insurers began to exit the Obamacare exchanges. "Substantial federal funding to directly reduce premiums would be available through 2021," the budget office explains. "Premium tax credits would continue to provide insulation from changes in premiums through 2021 and in later years." "Those factors would help attract enough relatively healthy people for the market in most areas of the country to be stable," the report said. The budget office projects that average premiums will rise in the short term, rising by 20 percent in 2018 and about 10 percent higher in 2019. By 2020, however, average premiums will be about 30 percent lower than they are now. By 2018, the budget office projects that 15 million more individuals would become uninsured due to the legislation's repeal of the individual mandate. These include individuals who may have only bought Obamacare insurance to avoid paying the penalty or those who would avoid purchasing insurance due to higher premiums. Following 2018, the budget office projects that by 2026 an estimated 49 million would become uninsured, compared with 28 million that would be uninsured if Obamacare remained in place. The budget office admits there is uncertainty surrounding these estimates—a popular criticism of the agency in the past. "Such estimates are inherently inexact because the ways in which federal agencies, states, insurers, employers individuals, doctors, hospitals, and other affected parties would respond to the changes made by the legislation are all difficult to predict," the budget office states. This entry was posted in Issues and tagged American Health Care Act, Better Care Reconciliation Act, Obamacare. Bookmark the permalink.